​In 2014, India was one of the first countries to enforce the legal requirement that large and mid-sized companies devote 2% of their profits to social development projects. Since then, the country has witnessed a year-on-year growth in total CSR spending, with an increasing chunk of corporate profits being directed towards education, health and sanitation initiatives. Advancing the state of reporting in India is particularly relevant given this increasing amount of spending on corporate social responsibility (CSR) projects. More consistent and comparable reporting will help stimulate accountability and measure the actual impact of CSR spending on the Indian economy, environment and society. Here we present a brief overview of GRI South Asia's recent events, highlighting why companies in the region are motivated to start reporting with the GRI Sustainability Reporting Standards (GRI Standards), and align their reporting with the Sustainable Development Goals (SDGs). On 6 July, GRI Regional Hub South Asia conducted a capacity-building workshop in collaboration with the Bombay Stock Exchange (BSE), to provide guidance to Indian companies making the move to reporting with the GRI Standards. Among the prominent companies represented at the event, were ACC Limited and the Mahindra Group. Another vital benefit for Indian companies looking to report with the GRI Standards is that they can be used to comply with the Business Responsibility Reporting (BRR) requirements mandated by the Securities Exchange Board of India (SEBI). Earlier this year, GRI released a linkage document in collaboration with the Bombay Stock Exchange (BSE) to provide guidance on linking the disclosures under these two frameworks. In addition to building reporting capacity and quality, GRI South Asia is also gathering business momentum to align corporate reporting in the region with the United Nations’ Sustainable Development Goals (SDGs). On 5 July, GRI South Asia and the Confederation of Indian Industry’s (CII) Centre of Excellence for Sustainable Development held the first of their 8-part dialogue forum series on the SDG Agenda 2030. 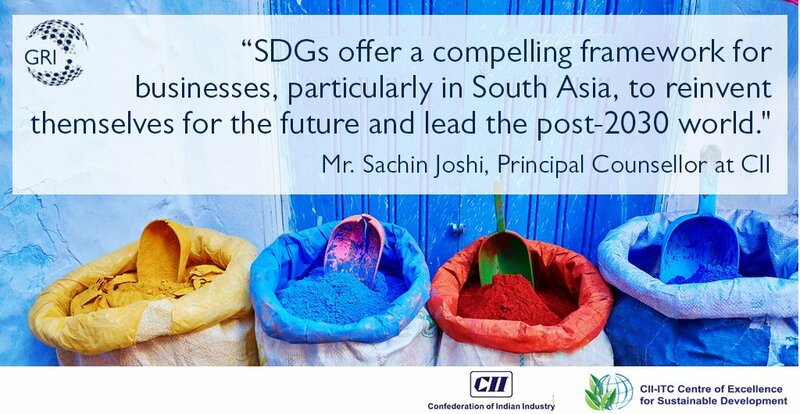 Speaking at the first dialogue forum, Mr. Sachin Joshi, Principal Counsellor at CII, outlined the motivation behind this initiative and why Indian companies should begin to emphasize the SDGs: “CII has partnered with GRI South Asia to improve the discourse of the private sector with SDGs. SDGs offer a compelling framework for businesses, particularly in South Asia, to reinvent themselves for the future and lead the post-2030 world." This regional initiative already includes several top names from the Indian corporate sector, such as Aditya Birla Group, Ambuja Cement, GAIL (India) Limited, ITC, Jindal Stainless, JSW Group, Jubilant Life Sciences, Mahindra & Mahindra Limited, Power Grid Corporation India Limited, Reliance Industries Limited, State Bank of India, and Tata Consultancy Services. The remaining seven dialogue forums, over the course of the coming two years, will spotlight several individual topics such as poverty and economic growth, investor expectations, food security, health, equality and education, management of natural resources, and stakeholder inclusiveness. If you’d like to know more about the upcoming dialogue forums and other reporting workshops in South Asia, please contact Dr. Aditi Haldar - Director GRI Regional Hub South Asia. To subscribe to the monthly GRI Newsletter, please click here.